KoopaTV: Free To Play...Station 4?! By LUDWIG VON KOOPA - The dangerous business model ensnaring the console market. One thing the console wars mentality gives us is a sense of camaraderie. Like the Trinity of Magic in Fire Emblem: Radiant Dawn. Dark magic beats Anima magic, Anima magic beats Light, and Light magic beats Dark magic. Within Anima, there is another triangle: Wind magic beats Thunder magic, Thunder beats Fire magic, and Fire beats Wind. Nintendo, Sony, and Microsoft are like the Anima magic, while PC gaming and mobile gaming are Dark and Light. (No word on exactly what magic they each correspond to... it's not important. You're free to comment your speculation on it, though.) We all don't like each other in console wars mentality, but we can team up against our greater sector competitors. Unfortunately, this camaraderie is breaking down. One example is that Sony, with its PlayStation 4 (supposedly it has now sold over 20 million of them, making it the dominant market leader), is fully embracing the free-to-play model, which is traditionally the domain of the mobile sector. This is according to Sarah Thompson at the 2015 Game Developers Conference. She is, according to GameSpot, a "senior account executive for PlayStation's free-to-play business". You know what that means? Sony has an entire DIVISION dedicated to free-to-play. And you know what that means? The cancerous environment plaguing mobile games is coming to a console near you! I confess that I've been a little murky or inconsistent with my beliefs and spelling of free-to-play (free-2-play just under two months ago?) over KoopaTV's short history. I once wrote there is nothing inherently wrong with the model. That was in 2013. I've clearly learned from that naive position. There are plenty of things inherently wrong with the model, even if developers aren't abusing it. Gamers are increasingly more and more against it over time. The last poll is still on-going as of writing, but the numbers are enough to gather clear trends. 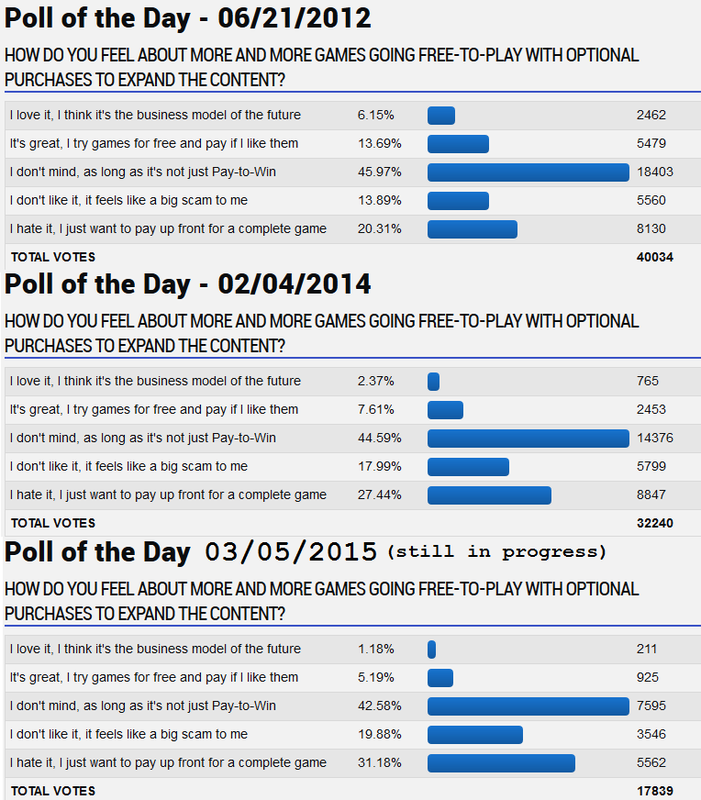 As you can see, assuming that the demographics of GameFAQs has managed to stay the same for the past three years, gamers more and more are becoming disillusioned with the free-to-play model. Back when it was newer, people thought of it more as a sort of demo opportunity. After all, game demos were certainly around back then and people liked those. But, no, free-to-play games are not like demos, as game developers have designed the games in such a way that many features cannot be accessed without paying up. I thought, on a theoretical basis, that consumer-side price discrimination was a fantastic, pro-consumer measure. You choose how much to consume, so free-to-play is sort of like a "pay-as-you-go" model, which I support for the United States Congress! Why wouldn't I like that for games? If we actually had a "pay $1 for every hour you play" model, that would be the best thing for the industry. But more on that in a future article. Sony is just seeing the potential dollar signs in exploiting free-to-play. They don't care that it's toxic to the environment and driving the price of games to zero, which is a disaster in reflection of a game's value. They don't care about arbitrary and deceptive practices. They don't even care that their own audience hates the idea and hates it even more the more they are exposed to it. And as the market leader, they have a responsibility. If they can't handle it, give someone else the reins. We suggest... the Wii U! Ludwig is not paid to promote the Wii U. He's also not paid to trash anything. Not even the trash. He gets some money back for recycling bottle caps, though. But not wine corks. Just something to mention. This is the second time in 30 days that KoopaTV covers a developer saying something bad for gamers at a conference! The first was Richard Hilleman at D.I.C.E. The Wii U still remains a great console to lead, but 3DS is going too much into F2P. What? If you noticed, on each poll, the "I love it" and "Don't mind it" got smaller, while the "Hate it" got larger (percentage). Now, back to the reason I commented. A $1 "Pay as you play" per hour? Don't worry, I don't mind opinions, but play that game two hours for a week, and you have wasted $14 you could've used on a good game like Earthbound, NES Remix, or dare I say, Punch-Out? Twice!? Also, suggesting the Wii U doesn't seem that bad. I mean, what are the odds of Nintendo making a free-to-play(*cough, cough* Wii Sports Club *cough* Pokemon Shuffle)? The rest, I agree. "As you can see, assuming that the demographics of GameFAQs has managed to stay the same for the past three years, gamers more and more are becoming disillusioned with the free-to-play model. " Disillusioned = They're liking it less and less. More and more of liking it less and less means I'm pointing out loving it gets smaller and hating it is larger. If you play a game for two hours for a week, then sure, $14 seems fine. EarthBound should last about 30 hours (that's what it lasted me, anyway. Or 35.) and I would've paid $30 for it, easy. Okay, but how about games like Animal Crossing and Pokemon (the actual Pokemon)? They make you play daily! In my activity log (who uses that? ), I've spent more than 300 hours on both games! I guess we could cap it out at some maximum limit. Up to the game manufacturer! There is a place in my own value system for undervalued (underpriced) games. Also I love my Activity Log, though 3DS one is slightly faulty for promoting the idea that Average Length of game session is an important stat. When you check a game just to clear Streetpass notifications, the average time spent in a particular game session lowers drastically. 4 & 5. It looks like I'm not crazy! Anyway, Nintendo's F2P things are experiments. Sony's are full commitments for the future.